Please note this article was first published in 21 Sep 2009. Its content may now be out of date. We recommend taking a look at more recent website building blog posts or check out our comprehensive support pages. If you are looking for information on our 14 day free website builder trial we have a large number of webpages that guide you throug the process. As highlighted in our last Blog, Internet Sales Figures are not only exceeding all expectations but are still flourishing. Bargains, deals and money saving promotions are just some of the factors that will drive online sales even further so make sure the Online Shop on your business website has plenty of options, teasers and deals to encourage maximum sales. Your DotGO Shopping Basket system makes it very easy for you to manage your stock and make sure that your customers have plenty of choices and offers. 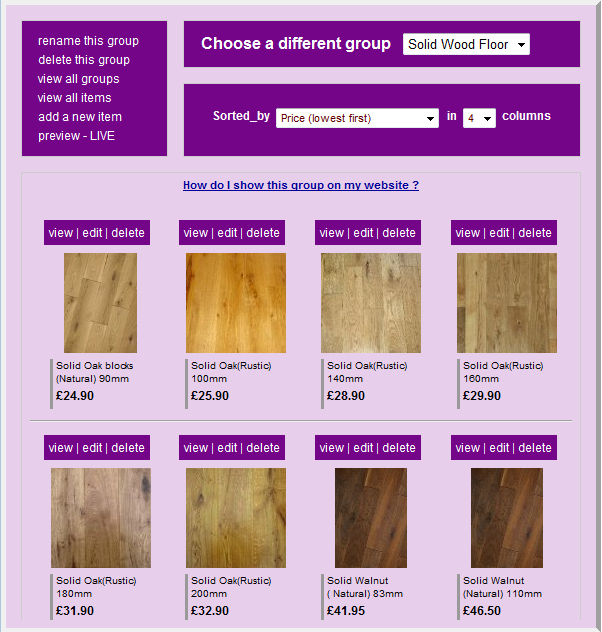 You will hopefully have created a group or groups of items, so now lets look at the options you can add. Click Step 4, then click the green “Edit” button next to the Group you want to work on. Here you‘ll see all the items in your group and on each you have a choice to: view, edit or delete. Click the “edit” button next to your first item. If you’re still happy with the basic information, click “Next” and “Next” again. 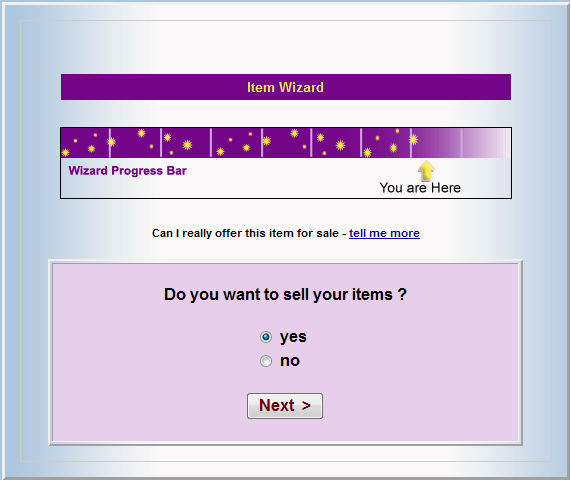 Now, you’ll be asked if you want to “Sell your items?” Click “Yes”. 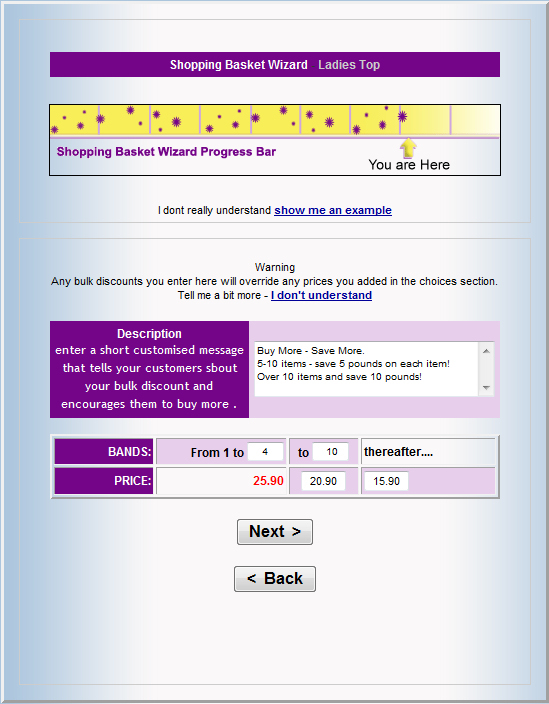 You’ll now enter the Shopping Basket Customisation Wizard. Choose your first item from the drop down menu. 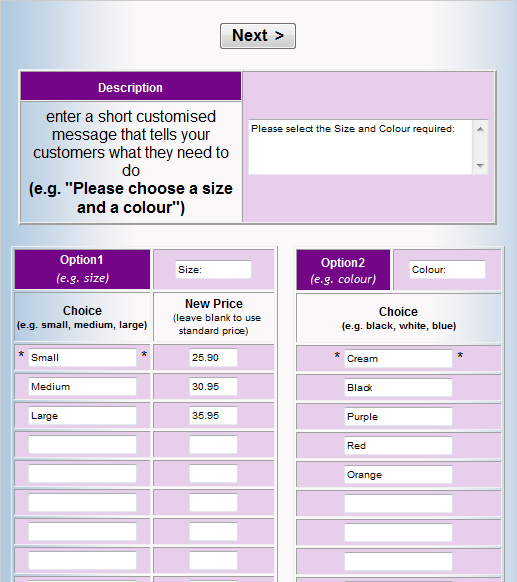 Click “Yes” to this option if your products have a choice of colours, sizes, styles or types. 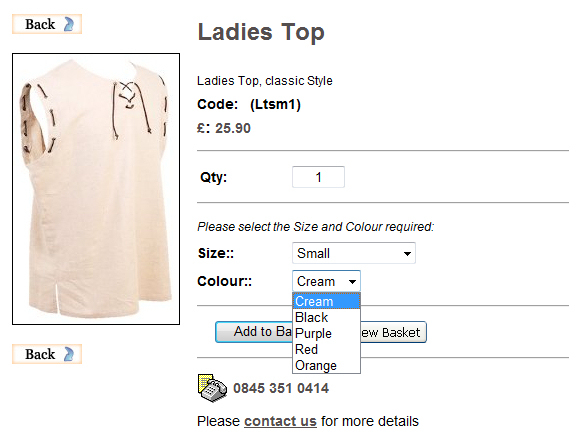 You’ll see a description box where you can enter a short customised message to tell your customers what they need to do. Then you can add up to 2 different options. Option 1 offers the additional facility to enter a “New Price”, so for instance, if you have a product, which comes in a choice of sizes at different prices, simply enter the sizes and their varying prices into the boxes provided. For options such as colour, which don’t affect the price use Option 2. Click Next to see how your item looks like with the new choices. Again, if you’re not happy, simply click back and make some changes. If you’re happy, click next. When a client has made the decision to buy, now is the perfect time to maximise sales. When a client reaches the checkout why not offer them other products that are compatible with the product they are buying. E.g. if a client is buying an item of clothing – this is a great opportunity to sell them a complete outfit! If you can take advantage of this option, click “Yes”. 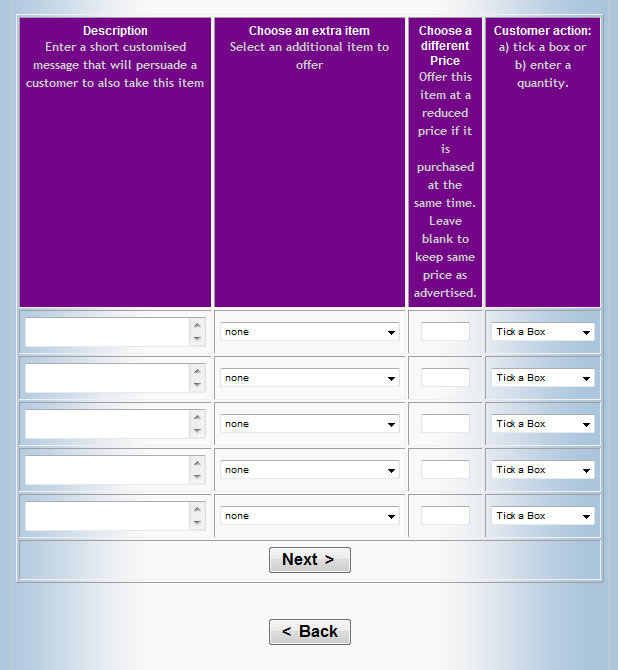 Again, start by entering a short customised message to persuade your customers to take the extra item(s). Choose the relevant item (s) from the drop down box, enter the price – at this stage you can offer a discounted price if you wish, to encourage the customer to purchase the extra item at the same time as their original choice. Finally, choose whether you want your customers to simply tick a box to add one item or if you want to give them the choice of purchasing a quantity of the item. We all know how annoying it can be when a persistent and desperate sales assistant tries to push you to buy stuff you don’t need. It can be a real turn off so only offer a small selection of most relevant items. Third Option – Bulk Discount. Offering discounts to customers if they buy more than one item is a proven sales motivator. In this section you can create ways of 'packaging' your items into quantity bands so that the more they buy the more they save. 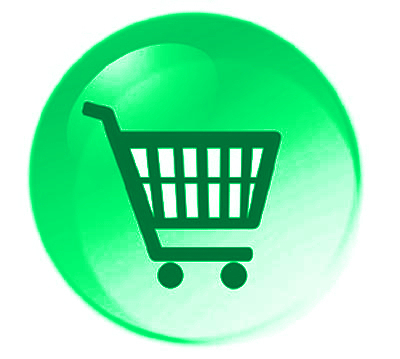 For example; customers purchasing between 1-5 items pay the normal price. 5-10 Items can be set at a lower price and above 10 items at a further discounted price. The set up is down to you. 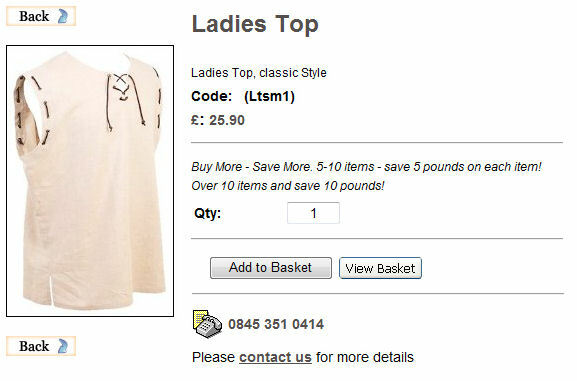 You can also add a customised message to explain how the discount works and encourage customers to buy more. Warning – If you set bulk discount prices here, they will override any “New Prices” you may have entered in the First or Second options. For example, you may have set a different price for a different size or a reduced price for an item purchased at the same time. These will be overridden by the Bulk Discount Option. At the bottom of each item view, customers are provided with your phone number and a link to your contact page so that they can contact you if they have any questions. Another great way for you to maximise sales and offer that all important customer service. Please remember, this article was first published 21/09/2009. The content may be out of date and you cannot post comments any more. Please check out our new blog.